You can only achieve a perfect work result with the right tool. 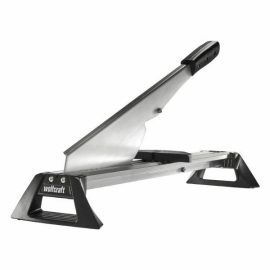 Wolfcraft products are the elegant alternative to jig, mitre saws and blades. They cut laminate boards almost noisless, do not need power and do not generate dust. They also have a cutter for vinyl which is a convenient solution for cutting and laying vinyl jobs. The LC 100 is ideal for carrying out simple laminate installation projects and is an alternative to using power tools such as a chop saw or jigsaw. It is quick and clean for cutting laminate with a thickness of up to 8 mm and a width of 210 mm. This LC 600 is indispensable when installing laminate flooring. It is ideal for the fast, convenient and safe cutting of all laminate flooring panels (including those with built-in sound insulation) with a thickness of up to 11 mm and width of up to 465 mm. The cutter can make angled cuts between 0° and 180°. Thanks to the serrated cutting guide, the work-piece is securely held in place during the initial blade contact and precise, unlimited longitudinal cuts are made possible. 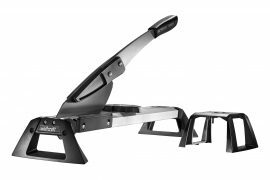 With its special blade geometry, the laminate cutter does not only cut quickly, safely and precisely, but also without generating dust or noise. 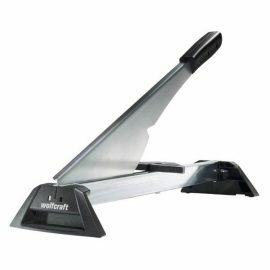 The Wolfcraft vinyl and laminate cutter VLC 800 is for installing laminate or vinyl flooring. 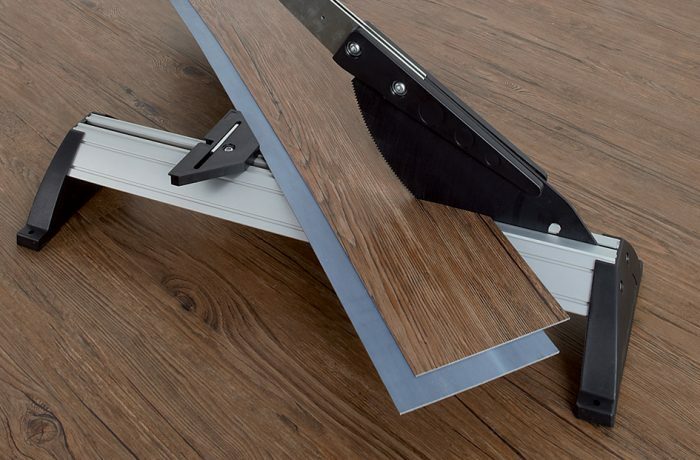 It is ideal for the fast, convenient and safe cutting of all laminate flooring panels (including those with built-in sound insulation) with a thickness of up to 11 mm and width of up to 465 mm; as well as for self-adhesive and click vinyl sheets and tiles with a thickness of up to 6 mm and a width of up to 465 mm. The cutter can make angled cuts between 0° and 180°. The blade is coated so it can easily handle of self-adhesive vinyl sheets. The VLC 800 has a practical parallel guide for 55 mm wide strip cuts, which can be installed on the left or right. Thanks to the serrated cutting guide, the work-piece is securely held in place during the initial blade contact. And precise, unlimited longitudinal cuts are made possible. With its special blade geometry, the laminate cutter does not only cut quickly, safely and precisely, but also without generating dust or noise. Made of aluminium, the VLC 800 is light yet sturdy.